SmartMedia Product Catalogue, discover the wide range of our products. Digital Interactive Podium, 32 touch points, 43" or 55"
Cloud-based software for sending Push Notifications on iOS and Android devices SmartNotifyMe! 3D Wayfinding Software: Digital Signage Solution to provide you with guidance indications via interactive touch display, with 2D or 3D models. 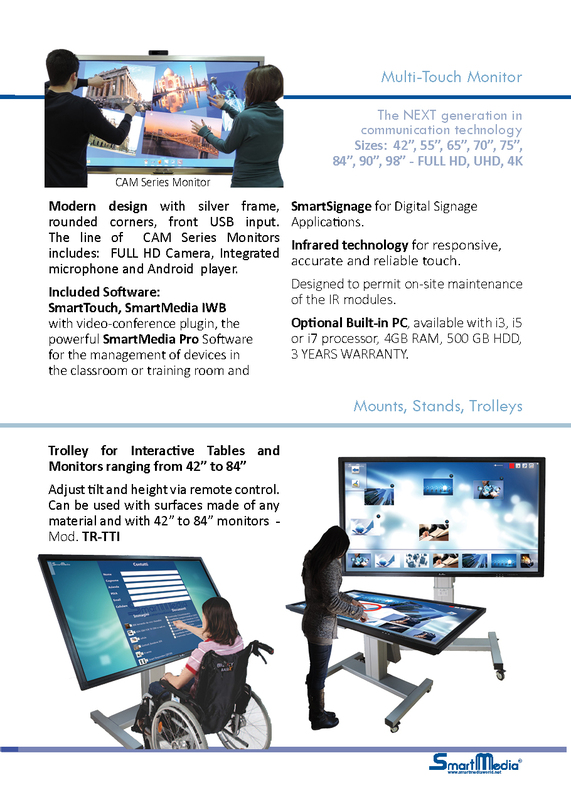 Infrared Series - 6 Touch Points, 84"
SmartMedia Touch Monitor SMA series offers you the next generation in presentation technology by providing multi-touch functionality and the ability for four people to simultaneously write. All the monitors are FULL HD LED displays. Communicate directly to your customers or followers smartphones, sending push notifications on their devices: mobile phones or tablets. Write and send the message from the cloud platform and let your contacts receive the message through the free app available from Google play or app store. Killian Oaks Academy in Miami is a wonderful school that serves children who demonstrate average or above intellectual ability, but for whom individualization, achieved through a diagnostic /prescriptive program, is vital to their success. With an atmosphere of support and acceptance, helps students develop confidence and a positive self-image and it challenges children to achieve their true potential. Killian Oaks Academy recently installed a new SmartMedia Interactive Monitor in its Music Room to give students a chance to develop their own learning attitude.